How to: MKIV Day Time Running Lights (DRL's). Thread: How to: MKIV Day Time Running Lights (DRL's). *Disclaimer* not responsible if you do this and your car bursts into flames or damages anything. Very simple to do on a mkiv supra. Go into your engine bay, open the fuse box. Run a wire from the one 15amp fuse to the other as shown. Then run a wire from the 15amp fuse to the relay as shown. Your low beams will come on with your key. These are great instructions! I tried this yesterday it worked but only for my right headlight. Then I kept blowing the HTR fuse in the kickpanel I'm guess because of the relay. Is this happening with you guys? What guage wire are you using there? Hmm. What year is your car? If it's a 97+ it might not work, as mine is a 93. Maybe they changed something for the 'series 2'? I'm not to sure what size wire that is, it's really thin, If I had to guess I'd say 20 gauge. Did you run the wires exactly as shown in the pictures? If only your one headlight came on that would mean the wire running from one of the 15amps to the relay is good, but then the wire running from the 15amp to the other 15 amp isn't quite doing it for some reason. Are you disconnecting your battery? If not I'd disconnect it, pump your brakes a few times, wire it exactly as shown, and report back. Not sure why your fuse would be blowing. These write ups seem to work for some people and not for others, I know there was a writeup like this for the gc8's, that worked for a few people but not others, they had issues with blowing fuses. Last edited by Braden; 04-17-2012 at 09:55 AM. 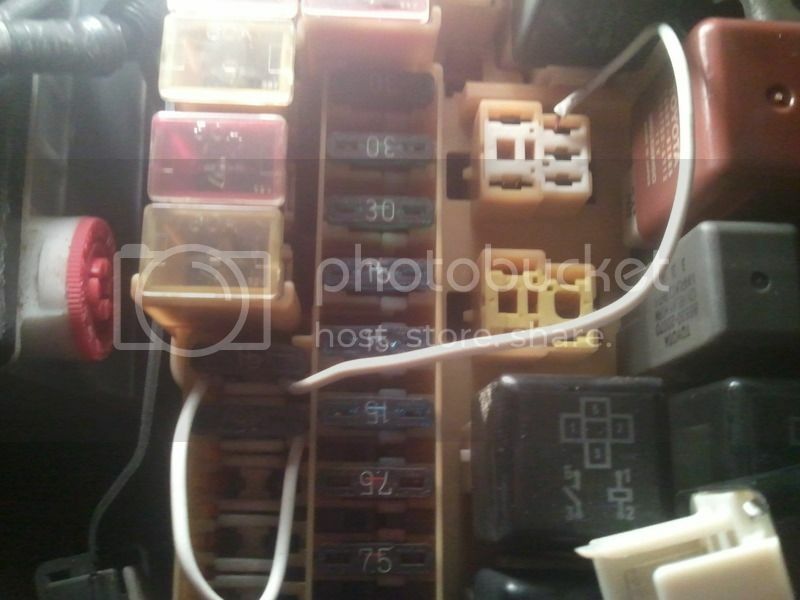 Just double check what your fuses do, and if it seems logical you should be OK.
Fuse 6 to 9 works on a Porsche 911(996). No messin with modules etc. 97s should have a light sensor as I'm finding out most toyotas past 1996 had these. Mines the 93.5 pre facelift. Sorry I forgot to mention I'm running HIDs. I haven't tried it with halogens yet. I am running as shown in the pictures using18g hookup wire from the source. Stupid of me to overlook the ballast in my connection. I'm thinking that the ballast are drawing way too much at once when they turn on and it trips the fuse or draws so much for the first headlight in the fuse circuit that it's only turning on the right headlight (first 15A fuse thats getting power in this mod.) I'll give it another try later with halogens hopefully this works. Anyone could post the picture showing connections?